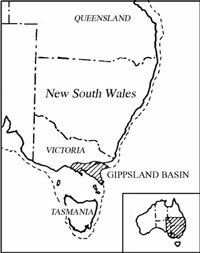 This article reports recent research which indicates that the oil and gas deposits in Bass Strait were formed from deep rapid burial of the same coal measures as those in the Latrobe Valley Brown Coal Deposits. The evidence indicates that the oil and gas are still being formed, a factor which strongly supports the conclusion that Bass Strait oil and gas are of recent origin. 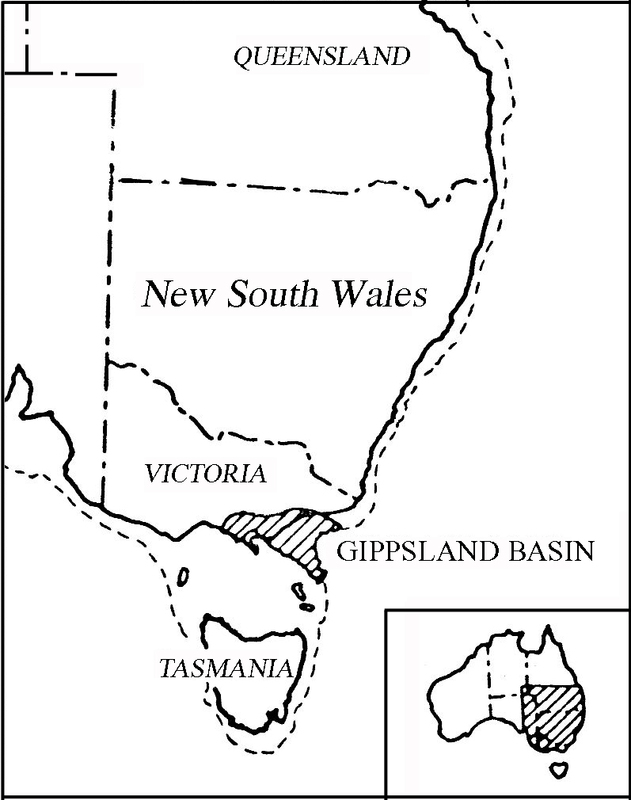 The Gippsland sedimentary basin is located in south-eastern Victoria, and about 80% of its total area is offshore in Bass Strait (Fig. 1). 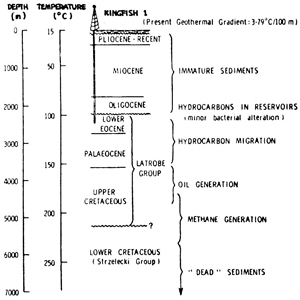 The sediments which fill the offshore part of the basin are shown in the idealised time cross-section of Fig. 2. Fig. 2: Sediments of the offshore Gippsland Basin, under Bass Strait&mdash;a time cross-section. 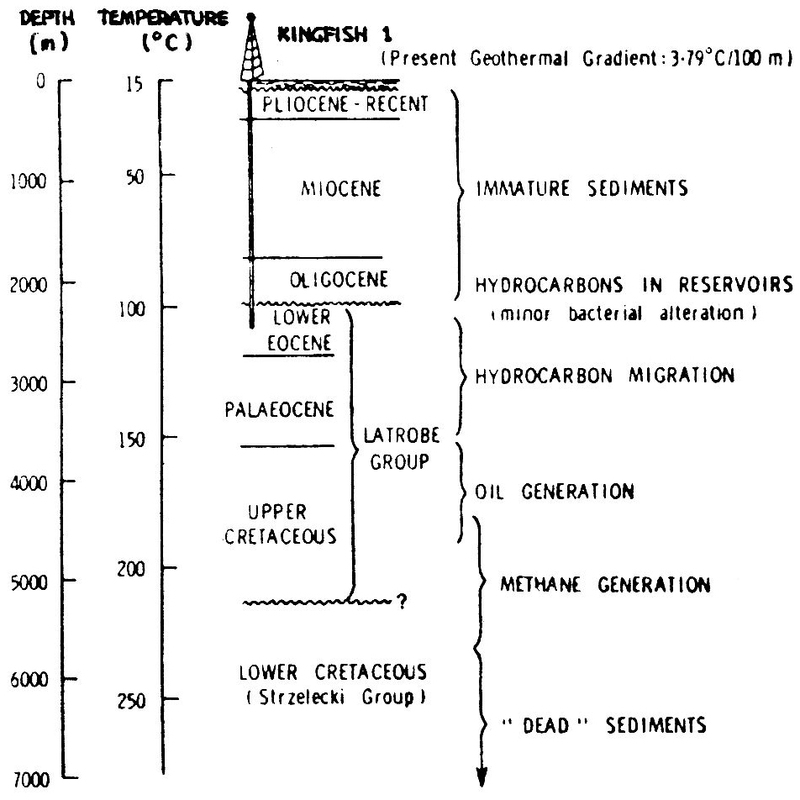 The oil and gas are supposed to have formed 20–40 million years ago. The first sediments deposited on the downwarped metamorphic basement rocks were the sediments of the Strzelecki Group—various greywackes (sandstones) with minor shales (sometimes slightly carbonaceous) up to 3,500m thick. James and Evans1 describe these sediments as ‘rapidly dumped’! Overlying the Strzelecki Group, in places unconformably, are the quartz sandstones, coals, mudstones, siltstones and shales of the Latrobe Group. In the Latrobe Valley these coal measures are about 400m thick (stacked coal seams representing up to 250m of this), but offshore while the sequence thickens to almost 5,000m, the coal seams gradually diminish in thickness and number.2 Complex channel systems were carved into the top of the Latrobe Group sediments soon after deposition (while still soft) and were then infilled with shale and coarse elastics (see Fig. 2). The top of the Latrobe Group is bounded by a regional unconformity or unconformities (representing, in this case, a brief erosional period between ‘waves’ of tidal flood sedimentation). Overlying formations are the Lakes Entrance mudstone and the Gippsland limestone. 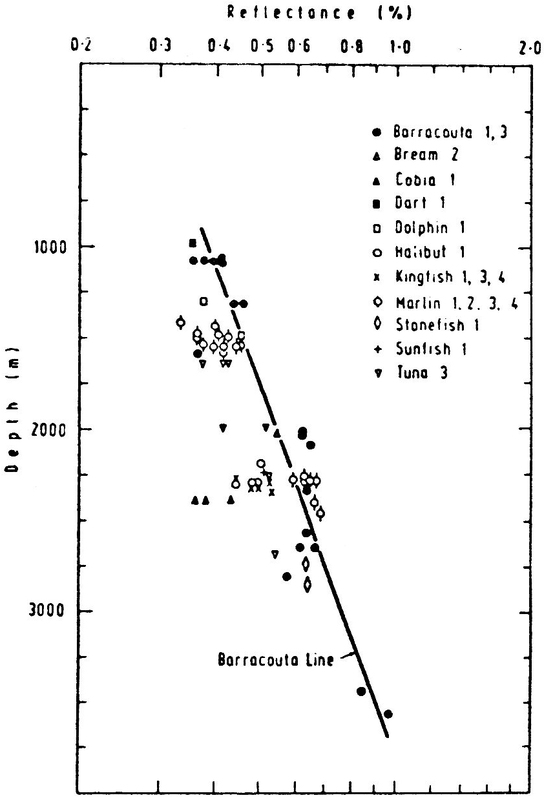 Exploration since 1964 has resulted in the discovery of at least four commercial oil fields (Halibut, Kingfish, Mackerel and Tuna) and three gas fields (Barracouta, Marlin and Snapper) (Fig. 3). At present between 60% and 70% of Australia's oil requirements are met from this basin; further exploration is continuing. Fig. 3: Location of exploration wells in the Gippsland Basin. Note the increasing depth to the top of the Latrobe Group southeast from the coastline. 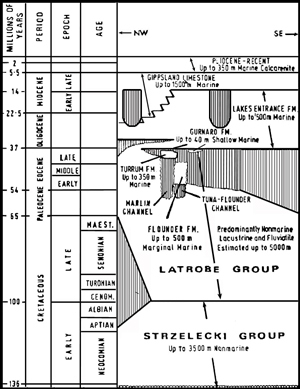 Most of the hydrocarbons are trapped at the top of the Latrobe Group in highly porous and permeable sandstones forming highs on the Latrobe Group/Lakes Entrance Formation unconformity surface (Fig. 4). The cap rock and lateral seal in such cases are the Lakes Entrance Formation mudstones. The Bass Strait oil and gas fields are primarily structural traps and occupy culminations along major anticlinal axes. 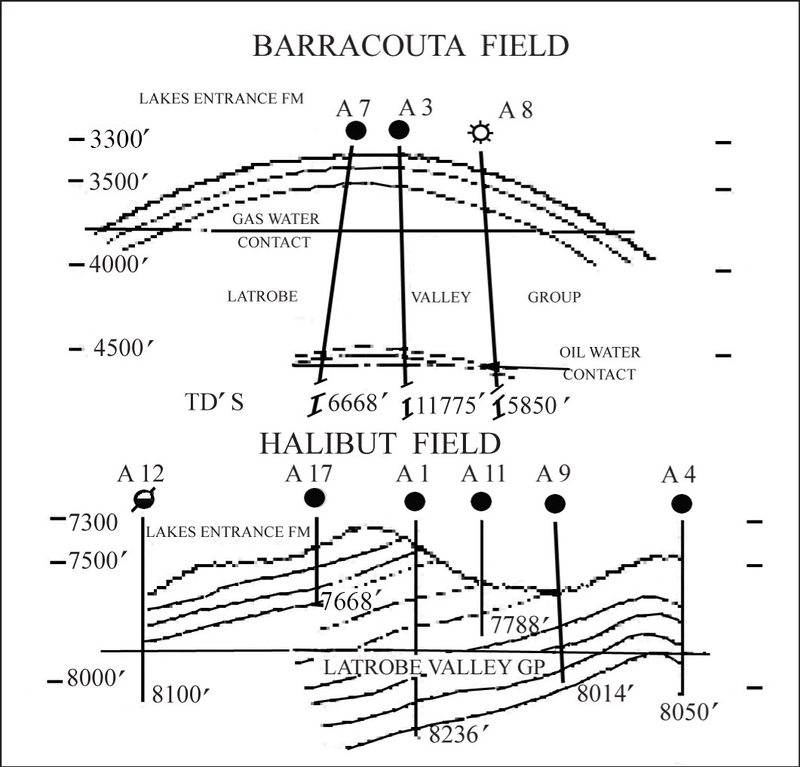 The Marlin reservoir, for example, has 300m of vertical closure covering an area of 137 sq km while to the southeast the smaller Halibut reservoir has a vertical closure of approximately 160m and an areal extent of 27 sq km. Fig. 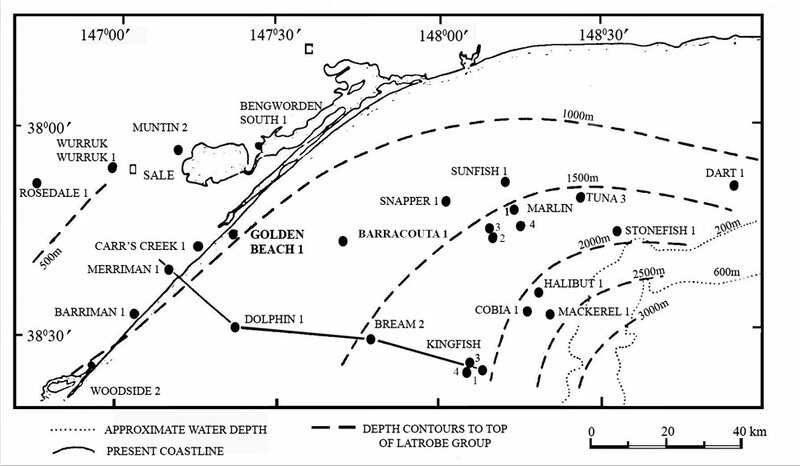 4: Representative Bass Strait hydrocarbon reservoirs at the Latrobe Group/Lakes Entrance Formation unconformity. Fig. 5: hydrocarbon trends, Gippsland Basin from the coast southeast into Bass Strait corresponding to increasing depth of burial of coal. Fig. 6: Reflectance of vitrinite in offshore Gippsland Basin wells plotted against depth. Fig. 7: Simplified cross-section of the offshore Gippsland Basin showing vitrinite reflectance profiles. Examination of drill core coal samples obtained from depths between 1050 m and 2300 m in different wells shows a gradual increase in diagenesis with increasing depth, the carbon content of the dry, ash-free coal increasing from 74% to 81% and the coal rank from sub-bituminous to high-volatile bituminous.3 By comparison, the offshore coals are of distinctly higher rank than the main onshore seams of brown coal at Yallourn (66.6% carbon and Morwell (70.2%), but those seams are only under between 9 m and 45 m of overburden. Reflectance measurements of vitrinite in Bass Strait drill core samples5,6 indicate a 0.3% to 0.7% range for most samples (Fig.6). Hence, samples of mature or actively generating organic matter are not readily available, except perhaps from a few of the deepest wells. 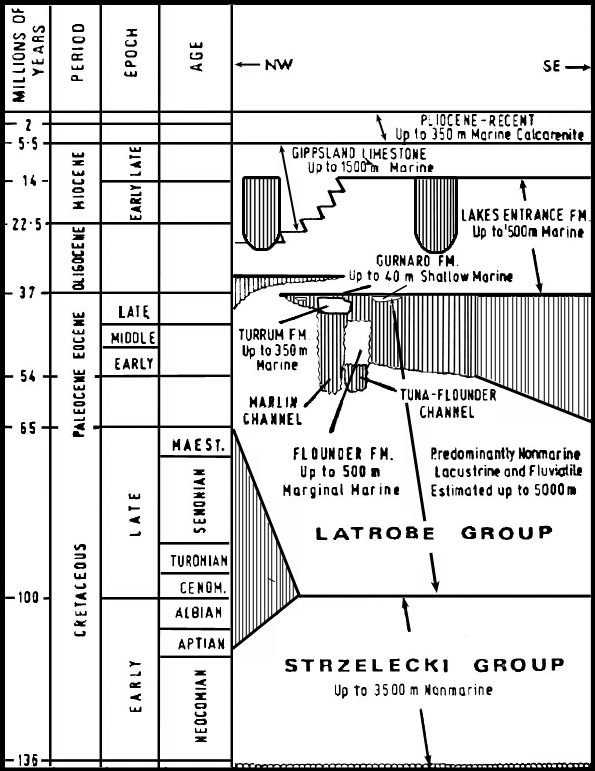 Thus the main source rocks appear to be the lower part of the Latrobe Group at depths greater than those reached by any of the exploration wells. A simplified cross-section, Fig. 7, showing vitrinite reflectance profiles based on the gradient shown in Fig. 6, supports the conclusion that organic matter in the lower part of the Latrobe Group is the source material for the hydrocarbons. Fig. 8: Section through the Kingfish 1 well showing the depth to the oil and gas generating zones below the reservoir in the lower Latrobe Group. Microscopic characterization of Latrobe Group carbonaceous material in core samples reveals high maceral (or coal constituent) contents of vitrinite (from lignin-rich plant material) and exinite (from algal and lipid-rich materials): a typical maceral composition is vitrinite 84%, exinite 12%, and inertinite 4%. 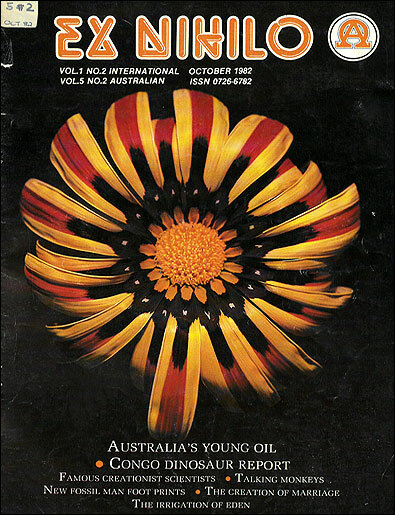 The exinite content—waxes and leaf, pollen, and spore cuticles—is unusually high compared with other Australian coals. The presence of exinite with a strong greenish yellow to yellow fluorescence in virtually all the cores examined by Shibaoka et al.5 is further evidence that the upper part of the Latrobe Group is above the maturation (or oil generation) zone. 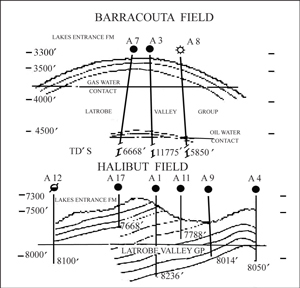 Hence microscopic work also shows that the upper part of the Latrobe Group, although rich in exinite, has not acted as the source of the oil and gas deposits. A few samples from near the bottom of the Barracouta No. 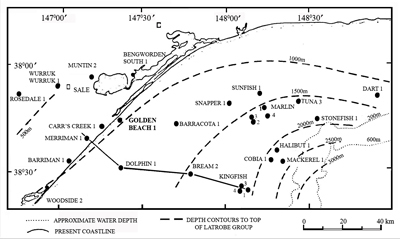 3 well, however, suggests a similar distribution and high content of exinite in the lower part of the Latrobe Group at depths greater than 4,000m. Shibaoka et al.5 therefore conclude that at temperatures greater than 130°C at these depths it is reasonable to relate most of the oil to thermal breakdown or cracking of the lipid-rich exinite. Comparable thermal cracking of vitrinite (and some exinite) at the same and higher temperatures (at even greater depths) would yield mainly methane (gas) and a solid non-volatile residue. Thus, on average, the gas has migrated further than the oil before both have been trapped in reservoirs under the Latrobe Group unconformity5,7 (see Fig. 8). Brooks and Smith3 conducted laboratory experiments heating Yallourn and Morwell brown coals under conditions which would be expected to simulate accelerated diagenetic (sedimentary burial) conditions. Such thermal treatment in the presence of water brought about an increase in carbon content corresponding to a conversion to a high-volatile bituminous (black) coal accompanied by the formation of liquid and gaseous hydrocarbons from the contained waxes and leaf, pollen, and spore cuticles, all in a matter of 2–5 days!3 This process is, of course, nearly identical to the even more rapid coal-to-oil conversion (or liquefacation) of the same brown coal now under commercial feasibility study. When endeavouring to correlate their vitrinite reflectance and geothermal gradient measurements from the various exploration wells, Shibaoka et al.5 found that the best explanation of differences was disequilibrium caused by recent rapid subsidence of the sediments. However, this disequilibrium not only indicates a recent rapid event, but an incomplete one. Thus, since the sediments are still subsiding, new exinite and vitrinite in the sediments are constantly being carried down into the oil and gas generating zones. 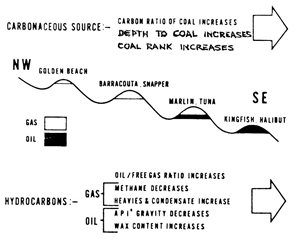 As a result Shibaoka et al.5 concluded that ‘hydrocarbon generation must be occurring strongly at the present time with the products migrating relatively rapidly either into traps or to the surface.’ This conclusion is consistent with the facts that (a) the hydrocarbon traps under Bass Strait were full when discovered, and (b) most of the oil in the reservoirs was low in sulphur5 indicating it has not been extensively altered by bacterial or other processes. 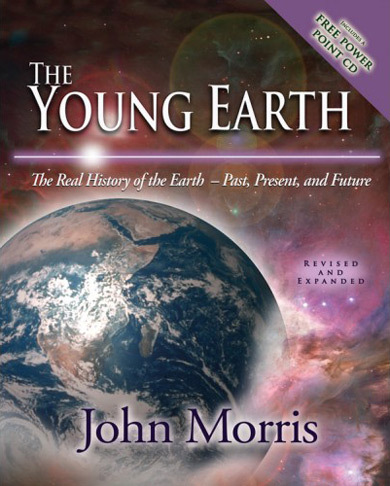 The above evidence alone indicates recent rapid burial of the coal-bearing sediments followed by rapid generation of hydrocarbons and very rapid migration of oil and gas into traps. 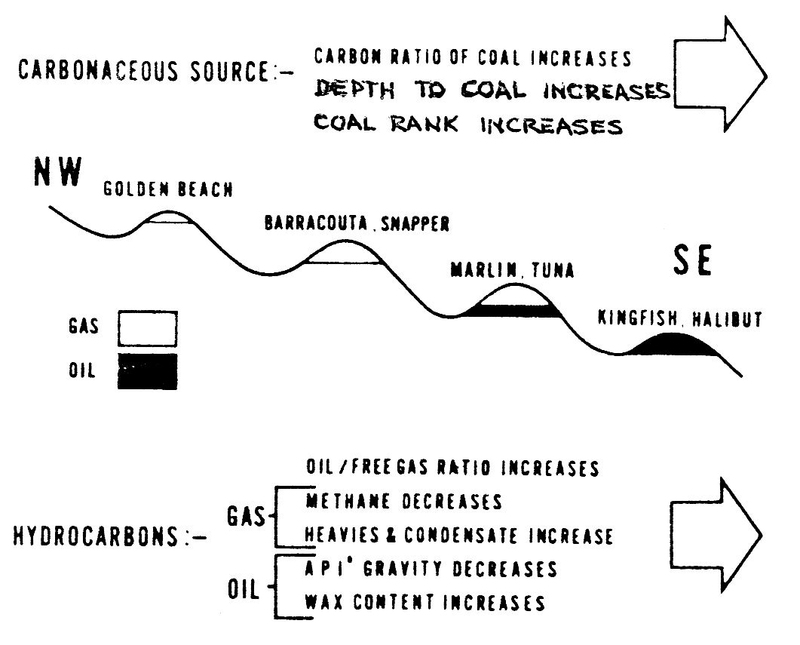 This is clearly contrary to the popular concepts of slowly forming coal bearing sediments and oil formations. James, E.A. 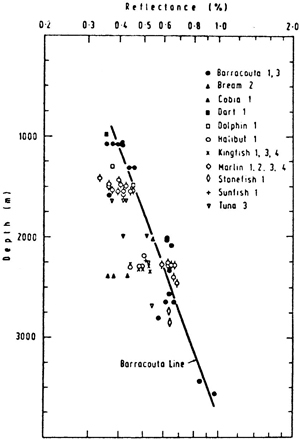 and Evans, P.R., APEA Journal 11(1):71–74, 1971. Return to text. Hocking, J.B., APEA Journal 12(1):132–137, 1972. Return to text. Brooks, J.D. and Smith, J.W., Geochim. Cosmochim. Acta 33: 1183–1194, 1969. Return to text. Brooks, J.D., APEA Journal 10(2):35–40, 1970. Return to text. Shibaoka, M., Saxby, J.D. and Taylor, G.H., AAPG Bulletin 62(7):1151–1158, 1978. Return to text. Kantsler, A.J., Smith, G.C. and Cook, A.C. APEA Journal 18(1): 143–156, 1978. Return to text. Saxby, J.D., APEA Journal 18:(1):137–142, 1978. Return to text.